KOE Europe has announced the addition of a new high performance 15" TFT to its range of Lite+ LCD display modules. The TX38D18VM2BAA is a transmissive mode display with XGA (1024 x 768 pixels) resolution. KOE's recently introduced range of Lite+ modules are designed and constructed using the latest display technology, components and materials to ensure a cost effective display solution is achieved. The 15" display has a high brightness rating of 1200cd/m², which is achieved with a white LED backlight that provides 50K hours of operation to half brightness lifetime. A contrast ratio of 700:1 ensures clear, concise image reproduction. Mark Stephenson, Technical Product Manager, KOE Europe commented, "The new Lite+ product range provides customers with displays featuring exceptional optical performance and product quality while ensuring a commercially viable display solution. Our strategy is to offer technology leading display products that are ideally suited to operation in many varied applications including high ambient light environments." He continued, "Some of the key features of Lite+ displays are high brightness, long life LED backlights and high contrast ratios that enable display images that are bright with excellent colour definition. 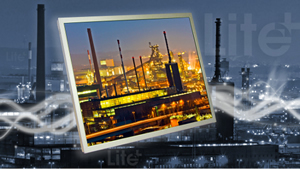 Lite+ display modules also implement industry standard display resolutions and data interfaces to aid and simplify the design in and integration process." The TX38D18VM2BAA supports a 20-pin, single channel LVDS interface that offers a user selectable option of 6-bit or 8-bit RGB data to provide a 262K or 16.7M colour palette respectively. The display module has mechanical outline dimensions of 326.5mm (w) x 253.5mm (h) x 11.5mm (d). An extended operating temperature range of -30°C to +80°C enables the TX38D18VM2BAA to be used in harsh environment applications. Applications include digital signage, point of sale, kiosks, ticketing and check-in.